The competition watchdog blocked Sainsbury’s proposed $9 bln takeover of Asda. CEO Mike Coupe has few palatable options to cope with German discounters and the revival of UK peers. Deal fever will resurface after the rot sets in and the grocer’s share price has fallen further. The indebted 4.2 bln euro French retailer has sold 470 million euros of supermarkets to U.S. buyout firm Apollo. The valuation looks adequate and the group’s shares are well above September lows. But leasing back its own stores will act as a drag on Casino’s recovery. The Russian retailer has lobbed in a rival bid for its domestic rival. Magnit’s approach is fuzzy and barely more generous than oligarch Alexey Mordashov’s swoop for a 42 pct stake in Lenta. But it might prompt minority investors to think twice about which offer they back. A decade after first investing, the buyout group is to sell its stake in retailer Lenta to tycoon Alexey Mordashov at an implied valuation of $1.7 bln. A 12 pct return is decent enough, but still below what TPG might have hoped for. After spinning off supermarkets and selling coal, $27 bln Wesfarmers is back adding to its sprawl with a $1.1 bln offer to buy Lynas. The attraction of owning the only major producer of speciality ingredients outside China is clear, but the financial and strategic cases less so. A takeover by Mikhail Fridman’s LetterOne could leave investors in DIA with heavy losses. But supporting the management means backing a $680 mln rights issue – almost twice the supermarket’s market value. After accounting problems and profit warnings, the former looks preferable. The supermarket chain promised to deliver 1 bln pounds of price cuts to ease fears about a tie-up with Asda. That might help its image with customers, but probably not change the regulator’s mind. Arguing that the grocery market is rapidly changing would be a smarter move. A 70 pct profit drop in the fourth quarter and a weak outlook wiped more than 10 pct off Kroger’s value. The company is trying to keep pace with the biggest players’ store revamps, e-commerce and delivery. But with additional pressure from discounters, it’s a race against time. The online specialist may sell a 50 pct stake in its retail division to Marks and Spencer for up to 900 mln pounds. That can fund investment in its fast-growing tech unit. The buyer will pay a hefty price for a delivery service that might struggle to hang onto current customers. Shoprite, the continent’s biggest supermarket chain, suffered its first half-year earnings drop in a decade. The big hit was from inflation and devaluation in frontier markets like Angola. Chasing Africa’s billion-plus consumers is one thing; doing so profitably is another. The private equity group might bid for the U.S. giant’s Asda unit if a 7.3 bln pound sale to rival Sainsbury’s is blocked. To get a decent return, KKR would have to crank up sales and margins – and write a big equity cheque. It’s not impossible but UK retail woes make it unlikely. Asian buyout firm MBK will list some of the hypermarket buildings it bought from Tesco. This $1.5 bln REIT should fly in yield-hungry Seoul. Yet the split could make it harder to sell the rest. Separating property and operating units was a boom-era trick that ended badly. 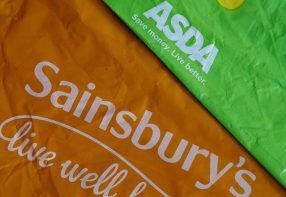 British regulators released a damning view on the 7.3 bln pound tie-up of Sainsbury’s and Asda, owned by the U.S. group. The pair need a plan to fend off German discounters. But the verdict limits M&A options. Asda’s global clout helps. Sainsbury’s looks set for further decline. UK competition watchdogs will soon opine on the grocer’s $9 bln acquisition of Asda. Its share price suggests investors think the deal will get the thumbs-down, or need painful disposals. A failed deal would put pressure on CEO Mike Coupe to come up with a new growth plan. Britain’s biggest grocer outsold rivals over a difficult Christmas period and fought off discounters like Lidl with cheaper offerings. Its operating margin targets are attainable even though Brexit-wary consumers are counting pennies. The company deserves a higher valuation. The e-commerce giant is pumping money into local bricks-and-mortar stores. Turning offline, as it has done at home, underscores boss Jeff Bezos’ ambition. It’s also a hedge against rival Walmart, should New Delhi allow foreigners freer rein in supermarkets and department stores. Regulators will include online and discount retailers when deciding whether J Sainsbury’s $10 bln takeover of Asda restricts competition. That is likely to mean fewer store disposals. But the watchdog’s focus on combined buying power squeezing suppliers could yet block the aisle. Britain’s biggest grocer is charging lower prices in its home market to fend off discounters, making it harder to hit operating profit margin targets. Doubling down with the launch of a new bargain chain may push shareholders into the arms of smaller rivals, such as Sainsbury’s. The troubled French grocer says it talked with its larger rival about a potential tie-up. The latter denies anything of the sort. An informal chat may have occurred but the Rallye-owned supermarket has scuppered a potential fix for its problems by revealing too much too early. The French supermarket’s heavily indebted parent got a fresh 500 mln euro unsecured loan. That buys Rallye time to sell assets and avoid handing over its 51 pct stake in the grocer to creditors. For banks which are already on the hook, it’s an attempt to avert a messy collapse.